After months of rows the new leader of UKIP in the Welsh Assembly is set to be announced after a ballot of members. Former Tory MP Neil Hamilton – ousted by Caroline Jones in May – is trying to remove her, with controversial AM Gareth Bennett also in the running. Whoever wins will lead the now five-strong group in the Senedd which has had two different leaders since they won their first seats in 2016. UKIP ordered the ballot when Ms Jones’s leadership takeover sparked a row. About 900 members have been given a vote. The count is taking place at UKIP’s headquarters in Newton Abbot, Devon. 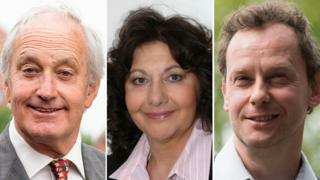 All change for Welsh party leaders? It is the first time grassroots members in Wales have had a say over who should lead UKIP in the Senedd. Nathan Gill was appointed UKIP Wales leader by the party’s former boss Nigel Farage in 2014. But he never got to lead the group in the Senedd – losing a vote of the seven newly-elected UKIP AMs to Mr Hamilton shortly after the 2016 election. Amid infighting over his so-called “double-jobbing” as an AM and an MEP, Mr Gill quit the group in August 2016 and eventually resigned from the assembly. The UKIP ranks were further reduced to five AMs in April 2017 when Mark Reckless defected to sit with the Conservatives. In May this year, Ms Jones ousted Mr Hamilton as assembly group leader with the backing of colleagues David Rowlands and Michelle Brown. Mr Hamilton, a former Conservative MP and UK government minister, later accused them of sacking him by text. He is in the running to take back control of the group, but is also facing competition from Mr Bennett, who attracted headlines during the assembly election campaign for blaming eastern European immigrants for problems with rubbish in Cardiff. Mr Bennett was briefly barred from speaking in the Senedd by Presiding Officer Elin Jones for remarks about transgender people – he claimed society would “implode” if there was too much “deviation from the norm”. Earlier in August the organiser of the ballot, returning officer Piers Wauchope, apologised to candidates after new UKIP members were unexpectedly given voting slips. The result has also been delayed – it was originally planned to have been completed by the end of July. Meanwhile the three other major parties in the assembly – Labour, the Conservatives and Plaid Cymru – are also holding leadership contests in the coming months.